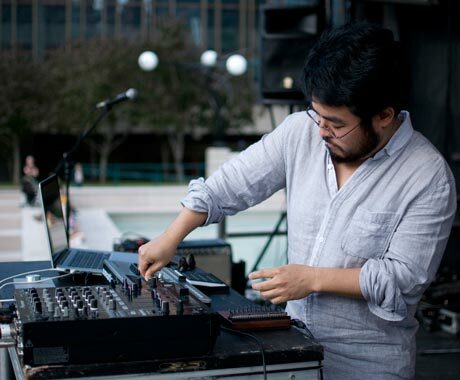 Experimental producer Yosi Horikawa brought his brand of sharp glitch beats coupled with serene ambience to EM15's outdoor stage. These elements were interspersed with an array of found sound — everything from aquatic bubbling to the chattering of bird-song found its way into the Japanese producer's set. The ping pong ball flurries of "Bubbles" — a track deeply reminiscent of Aphex Twin's "Bucephalus Bouncing Ball" — complemented the evening sun beautifully with its numerous layers of biotic loveliness. At times, Horikawa's music sounded like a million plastic forks swirling in a wind tunnel, while other instances came across more like a collaboration between Four Tet and Nosaj Thing. Regardless of the format, Horikawa remained fresh and charming throughout. His EM15 set struck the perfect balance between organic and electronic.